In geometry class they taught us, “The shortest distance between two points is a straight line.” That made sense to me then, and it makes even more sense now. A straight line is the most direct connection. There are no detours or meandering. Is it possible for someone to be cuddled and not feel anything? It’s possible that the more open you are… the more you will receive. But I can’t imagine that a person wouldn’t feel anything. Hopefully it would give even a closed person a glimpse of the infinite tenderness they are capable of receiving. “I put up a lot of walls,” he said with some sadness. Cuddling is the opposite of putting up walls. Cuddling is peering over and around walls, or removing them completely. Walls are built to prevent connection, to make the distance between two people greater. When we cuddle, it’s about two people letting themselves be vulnerable, coming to the encounter with open arms, open hearts. For me, cuddling is one way I try to love people better. 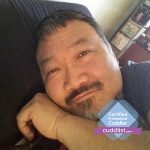 Let me end by telling you about two clients I’ve had as a professional cuddler in my first year with Cuddlist.com. I’ve changed their names. For starters, she is a psychotherapist. When I learned that, two things went through my head. One, how cool that someone from a more traditional healing profession understands the therapeutic value of paying for cuddling. And two, how intimidating to be cuddling a professional therapist! Will she think I’m bogus? I asked her what she wanted from the session. She said, “I want to be able to ask for what I want, and to receive what I ask for.” She said she was nervous, so I started by letting her page through The Cuddle Sutra, a book filled with several depictions of creative positions. She found one she liked and we performed it. We both lay back on the bed and she simply crossed one of her legs over mine. Such a tiny point of contact but it felt great. I felt the warmth where our legs crossed. I felt the comfort of lying beside someone, breathing slowly together with her. She loved it. And she got what she asked for! Vincent is a salesman who has been happily married to a woman for a few decades. But some years ago, he was in Central America when he contracted a tropical disease and almost died. It made him look at his life differently. It awakened in him his desire for the touch of another man. He’d never heard of professional cuddlers or cuddle meetup groups until he stumbled upon them in a google search. That’s how he found me. I asked him what he wanted. He said, “I’ve never cuddled with a man before. That’s what I want.” And that’s what we did. We hugged, we spooned, I held his head, caressed his face, we joined hands, talked, laughed. “I felt like I was cuddling with a good friend,” he said enthusiastically. He made an appointment to have a cuddle session the following month and Vincent became my first repeat client. Dwight is a Professional Cuddler with Cuddlist.com and he is based out of Chicago, IL. His skills & specialties are: Being a facilitator of a regular cuddle group and a recipient of one-on-one professional cuddles. Dwight has learned the value of both group cuddling and private cuddling. Dwight has been a practicing Buddhist for over 25 years, working for world peace through individual happiness. Dwight believes cuddling is an inalienable right for all humans, whether they are partnered or single. Dwight is easygoing, a good listener, and has a good sense of humor. View Dwight’s profile and book a session with him here.